Notice: for those of you who just in the latest times got in touch with this blog I work for Gabetti, one of the biggest Real Estate companies here in Italy and I produced and managed its world renowed Second Life project; so this post might be kinda influenced, but this is MY blog isn’t it? Today I got in touch with a post (in Italian) that (re)launched Google Earth (and its latest web browser plugin) as the mantra tool for real estate: it’s 3D, it renders the buildings (sort of), it lets you plan and build whaterver building you like. And it’s been kinda crrrrepy experience: yes it makes you seamlessy move in a 3D space but the overall experience really lacks of all that magic I got acquainted in Second Life. In the nearly couple of month since my last post a lot of tasks of my professional life have reached their place in the cosmical karma. 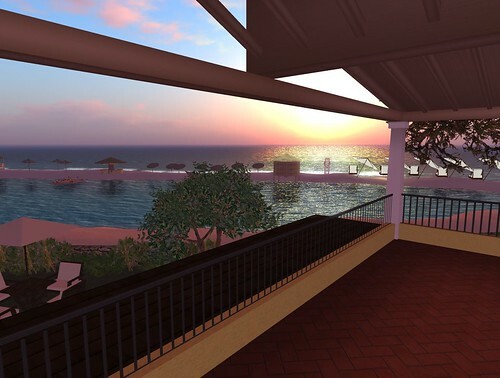 One of these is the release of the Myrsine Island on Second Life: a perfect replica made by Electric Sheep Company of a residence Gabetti is building on the Island of Sardinia (and that will be ready in 2010). You can take a look at the product site or take the whole tour at the buildings in Second Life. The choice is yours. This is a complete new experiment in SL for the Gabetti Group: we’re starting using the metavers not for metaverse’s sake but for RL business stuff; Myrsine island will be used by the Group agencies devoted to its commercialization as a tool to showcase the apartments to potential clients and – at the same time – it’s going to be a tool for foreigners to take a visit to the apartments, before buying, before leaving their countries. Just a bit of info for the moment. And I still owe Leeander a post about his latest innovation disruptive project: Open Spime. 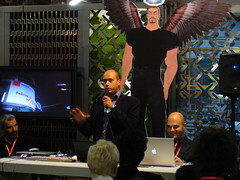 I’m on a fast train connecting Florence to Milan together with my colleague Luciana (aka the uber wonderful Luciana Gabetti): today I had a talk at the Creativity Festival at the Second Life pavillion on the economy of the Gabetti project in the metaverse. I don’t want to bother you with so much showcased informations and data (but, if interested, you might want to take a look at my latest presentations – both in Italian and English) but – instead – I’d like to share with you the thoughts that are crosing my mind will looking out of the window, in the glowing dark of the Italian countryside. Simple is effective. Be simple to be effective or – in other words: increase your simplicity to increase your effectiveness. I’ll talk about presentations in this post, but – probably – you can adapt this to other scenarios too. Why? Because you don’t know anything of the scenario your going to find and the conference centre; you cannot know whether or not the audio mixer will melt up just before your presentation or the internet connection automagically crashes in the very moment you click on the link. Another guy based his introduction to the usage of a very laughable video of a famous italian showman; please note that the video itself wasn’t important but what the showman said in the video was the topic the speaker would have moved on… but there was no audio cable in the room at all; so the presenter tried to move the mic (with a HUGE tweet while passing in front of the speakers system) the mic nearer to the computer speakers… but no sound were heared at all. Creepy. On videos, again: a presenter choosed to use a Flash Video… choosing to compile it, in the Flash IDE, during his speech (and, by the way, audio and video were out of sync);The last one. Promise. It’s been a while I learnt an interesting lesson: your audience NEVER know when something in your presentation has gone wrong… until you tell them. This man chose to link a file from his presentation but something gone wrong and the magnificent “file not found” window opened. And, adding problems to problem: he started looking for the file in the operating system! Conclusion: the simpler your presentation is (and I’m speaking about presentation style and technical aspects) the more chance you have to appear a really smart presenter.